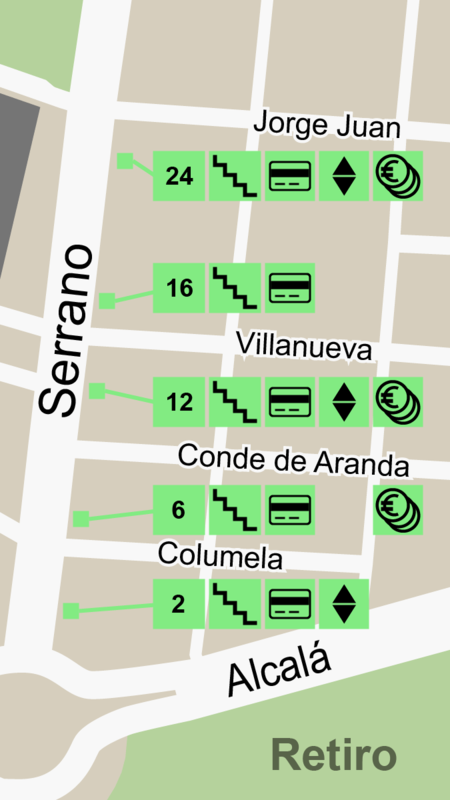 The Serrano Juan Bravo parking lot is located between Hermanos Bécquer and Marqués de Villamejor streets, has a first floor for public use, and three floors for residents. The public parking area runs along Serrano street. 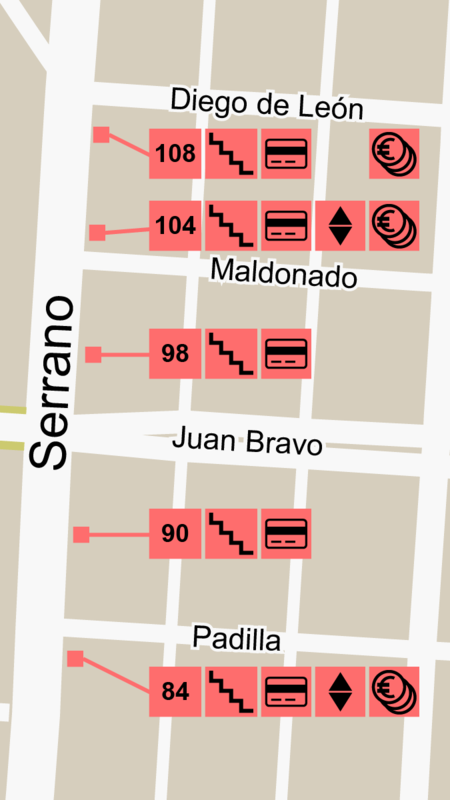 The resident floors are divided at Juan Bravo street by the Metro line. For that reason, residents access to the northern part of the car park is provided by an exclusive entrance on Hermanos Bécquer street. In order to leave the car park towards the Castellana area, it is better to exit by Hermanos Bécquer street at the northern end of the car park. Exiting by Juan Bravo street, meanwhile, leads the driver up towards Velázquez street. 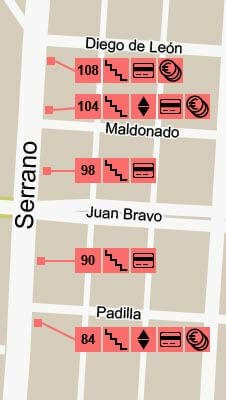 Pedestrian exits are located at Serrano street numbers 108, 104, 98, 90 and 84. A lift is available at all exits. The exits at Serrano 84 and 104 emerge at street level, while the other exits open out to a mezzanine that is very close to the street. The customer service center is located in the basement -1 near Juan Bravo street. Ticket payment is also available through automated cashiers that accept credit and debit cards as well as cash. These are found at the Serrano 84, 104 and 108 pedestrian exits. The automated cashiers near the customer service center (at Serrano 90 and 98) accept only card payments. The Serrano II car park, located in Serrano´s most active shopping area between Ortega y Gasset and Hermosilla streets, has one and a half floor of public parking located at levels -1 and-2 respectively, while the rest of the facilities are resident use only. The car park has two common entrances – one at level -1 from Marqués de Villamejor and Hermosilla streets, and another at level -2 directly from Ortega y Gasset street. The exits drive you to Castellana, either to Ayala street from level -1 or to Ortega y Gasset from level -3. 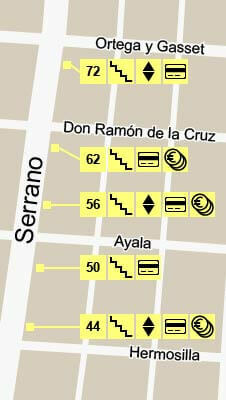 Pedestrian exits are located at numbers 44, 50, 56, 62 of 72 of Serrano street. All of these exits are equipped with a lift. The lift opens out to street level at numbers 44, 56 and 72 of Serrano street. At the other exits, the elevator opens out to a mezzanine very close to the sidewalk. The custormer service center is located in basement -2 at the northern end of the car park near Ortega y Gasset street. Ticket payment can be made by automated cashiers that accept cards as well as cash. These can be found at the exits by numbers 44, 56 and 62 of Serrano street. The automated cashiers closest to the customer service center near Serrano 72 and 50 only accept card payment. The Serrano III car park is located by Retiro park, right in Madrid downtown, between Jorge Juan street and the Puerta de Alcalá, has a public parking floor at level -1, and three floors for resident use. There is a public and resident common entrance at Jorge Juan street and Alcalá street, with a second gate for residents at level -2 exclusively. To exit towards the Castellana, you can use the exit located at the southern end towards Salustiano Olozaga street, or from the northern end near Jorge Juan street. Drivers heading Velazquez street should take the latter exit. 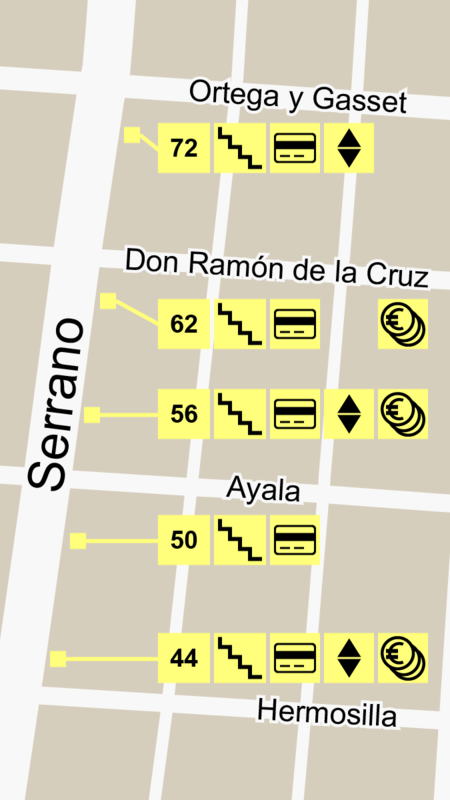 There are pedestrian exits at the level of Serrano 2, 6, 12, 16 and 24. All of these exits are equipped with a lift that opens out to street level at numbers 2, 12 and 242 of Serrano street. At the other exits, the lift opens at a mezzanine very close to the street level.. The customer service center is located in basement -1, at the southern end of the car park near the Puerta de Alcalá. Ticket payment can be made by automated cashiers that accept cards as well as cash. These can be found at the exits near numbers 6, 12 and 24 of Serrano street. 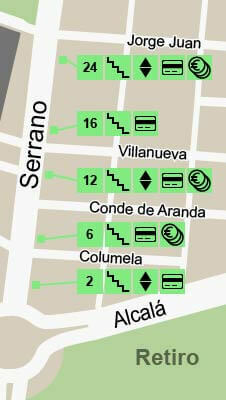 The automated cashiers that are close to the customer service center at Serrano 2 and 16 only accept card payment. Public parking Benefit from all Serranopark services at the best prices per minute of the area. Your own parking space Serranopark performs marketing management of these places, which are municipal property. Monthly tickets Different types of subscriptions to suit all your needs. From minute 0 to 30: 0,0425 €/minute. From minute 31 to 90: 0,0381 €/minute. From minute 91 to 660: 0,0508 €/minute. From minute 661 up to 24 h. (max. ): 32,5189 €. Are you resident in Madrid? Is your company based in Madrid? Don´t you have any other public parking space? You can acquire up to 5 parking spaces! Call us 91 436 20 85 and we will inform you. Provide us the plate numbers of the cars you want to park in and enjoy! How can I visit the car park and check the still available parking spaces? If you contact us, we will be glad to show you the floor plan with the available spaces, and walk you through the parking lot so you can choose your best space. Is it necessary to go to the City Council offices? No. Should you decide so, Serranopark will handle your application, so you can avoid all the paperwork. In case of a Company, what documentation must be presented for an application? Copy of the company´s certificate of incorporation. Copy of the power of attorney of the person signing the contract. Copy of his or her national identification card. Copy of the company´s tax identification number. Copy of the latest VAT and corporate tax payment (Mod 200 & Mod 390). Copy of the latest VAT Tax Return (MOD 390). Copy of Business license (IAE or Mod 036). If the company owns the property where is based, copy of the property title; if in a rental office the copy of the rental agreement. In case of an individual, What documentation must be presented? Individuals applying for a lot have to present their national identification card. If the address standing in the card is different from where the applicant is living, then a registration certificate. Why do I need to submit the plate numbers? Information about the plate numbers is needed as it allows to control that all vehicles in the parking lot comply with its rules of use. Do you want to contract a monthly ticket? Call 91 436 20 85 and we will inform you. Always thinking of youAt Serranopark, we understand that our customers are our reason for being. All parking lot – both public and resident park spaces – is equipped for full mobile 3G coverage, so that you do not have to interrupt your conversation upon entering the car park. Each parking has several charging stations for electric vehicles. Thinking of the safety of your car, each parking space is equipped with a tire pressure meter so that you will have no worries at the start of your trip. Should you leave your car parked for a long time and find a dead battery, you need only approach the customer service, where we will help you avoid this ruins your vacation. Thinking of babies and their parents, we have equipped all our parking lots with a baby changer, in the case of emergency before the trip. At all car park levels, we have reserved for those with disabilities a percentage of spaces located near the exits with lifts. They are marked with a blue light so that they can be easily identified in the public parking areas. Should you be suddenly caught in the rain, don´t hesitate to ask for an umbrella at the customer service – which will be gladly lent to you. Together with the linear shape of the car park, which lets you park at precisely the street area where you are heading, you will never have to arrive wet at a meeting or date. Of course, if you think that we can somehow improve the service or the facilities so that we can attain the car park we all want, please use our box buzon@serranopark.es for your suggestions. We will study them and reply back to you as soon as possible. On 8 August, 2008, the Madrid City Council awarded the project to refurbish Serrano street to a consortium including Cintra Infraestructuras and Iridium Concesiones, together with the design, construction and operation of three car parks with a total of 3,297 public and resident park spaces. The project entails the total transformation of Madrid´s most exclusive avenue – inviting pleasant strolls through its shopping area with an increase of up to 64% in sidewalk space, as well an enhancement in environmental quality throughout the area. 813 new trees have been planted and over 2.1 kilometres of bicycle lanes built. The avenue has also been equipped with the most modern urban furniture – providing meeting and rest areas. This urban reorganisation was completed with the creation of two lanes devoted exclusively for public transportation – one for buses and another for taxis – with another three ones for private vehicles. All car park entrances and exits are located on streets adjoining Serrano, which have also been transformed by the project. The new avenue was inaugurated on September 25, 2010. The new car parks were opened to public on December 4, 2010 – with the presence of the his Excellency the Mayor of Madrid. Altogether a new engineering milestone in Spain. Over 9,000 tons of steel. Over 125,000 m3 of on-site concrete. Over 65,000 m2 of precast slabs. Over 87,800 m of shafts from 450 to 850mm in diameter. Over 65,000 m2 of granite. Over 11,000 m of curb. Over 56,000 m2 of flex pavement. During construction, more than 350 men worked simultaneously together with 80 engineers and administrative personnel. Replacement of the sewage network with over 3,000 m of man accessible sewer tunnels with 150 manholes. Replacement of the natural gas network with pipe diameter of up to 65". Replacement of the telephone networks of 5 different companies with over 30,000 m of cable and 6 stations. Replacement of over 4,500 m of CYII (Madrid water system) pipelines of up to 850 mm in diameter. A new power substation and 10 new transformer centres. A new service tunnel along Serrano street over 1,600 m long. All of this work was carried out with the highest respect for the environment and the most stringent quality controls. All of this work – thinking of you. Our mission is to be at the level of our location, offering our customers the best service ever under the point of view of security and comfort in an unbeatable infrastructure, allowing our employees to actively participate in the future through innovation, and to our shareholders to perceive these efforts in terms of their profitability and image enhancement. In this way, we seek to comply with our commitment to improve Serrano Street and the city of Madrid. Our vision is to generate trust amongst our customers so they stop worrying about all their transport needs. Serranopark is not merely a car park company seeking to provide a service. We at Serranopark are a group of people who strive each day to help our customers in any way we can, being lucky enough to carry out this task in an outstanding location in the centre of Madrid, within a car park that is changing the way of seeing how infrastructures can lead us into the future. Are you thinking of strengthening your image in Madrid´s most exclusive area? Do you want to associate your brand with the most luxurious shopping street in Madrid? Every day we are winning over the trust of new corporations that commit themselves to the collaboration project that only Serranopark can offer. © Serranopark, S.A. España 2011. All rights reserved. The content of this website, either whole or in parts, may not be reproduced, distributed, transformed, made available to the public, nor communicated to the public, by whatever means or procedure, without the prior written consent of its owner. Serranopark S.A. reserves the right to update, modify or eliminate the information contained on its website, and to limit or deny access to said information. The information contained on this website is effective as of the date of the latest update, and must be considered as information intended to orient the user with regard to the products, services and other information in these pages. The user may confirm the date of the most recent update for any information by requesting such information through the email box available on the website. Any formal or numerical errors that may be found in the different sections of the www.serranopark.es website resulting from incomplete or defective maintenance and/or updates of the information contained in those sections shall not be regarded as misleading advertising. In compliance with that set out in this section, Cintra Aparcamientos promises to correct such errors as soon as it is aware of them.